Wine glass giveaway in collaboration with Houseology. Wine aficionados will be well aware that the type of vessel wine is served in affects the flavour of the drink. Go on, try to drink a nice Cabernet Sauvignon out of a tin camping mug and see how well that goes for you (I might be speaking from experience here…). 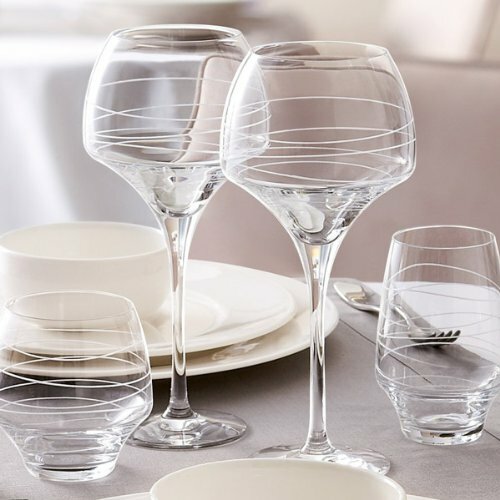 Chef & Sommelier are a world renowned French glassware company dedicated to creating the perfect wine glass. They have developed a new glass formula – Kwartz, which is more transparent, more lustrous and more resistant than any other glass material. In 2014 they developed the Open Up Arabesque range for leading hotels and restaurants – an elegantly styled glass with angles designed to allow the contents of the glass to release their molecules, concentrating the flavour of the drink on the middle of the glass. The rounded inward body, sizable oxygenation space and closed rims allow the aroma of the contents to concentrate in the glass, so you get the full wine tasting experience with each mouthful. Their glasses are finished with a sleek stem and smooth flat base; the ideal piece to serve your guests with or to simply pour yourself a glass of wine in after the end of a long week. This stylish range of Chef & Sommelier Open Up Arabesque glasses are available from Houseology: The Online Interior Design Store from £42.50 for a set of four champagne flutes (pictured above on the far left) to £50.50 for a set of four of the 55cl tasting tannic wine set (pictured above, far right, with the red wine in it). All in all these are some seriously gorgeous wine glasses and I love the little line circling around it. They are generous in size and look incredibly beautiful on any table setting. You’ll feel like you’re in a posh restaurant in the comfort of your own home! Houseology have very kindly offered the chance for one of my UK readers to win one of their best selling Chef & Sommelier Open Up Arabesque Tannic Tasting Wine Glass Sets worth £50.50. Simply fill out the Rafflecopter entry form below! For your chance to win aSommelier Open Up Arabesque Tannic Tasting Wine Glass Set worth £50.50 enter using the Rafflecopter form below. Come back and tweet about the giveaway every day for more chances to win! The prize is offered and provided by Houseology. 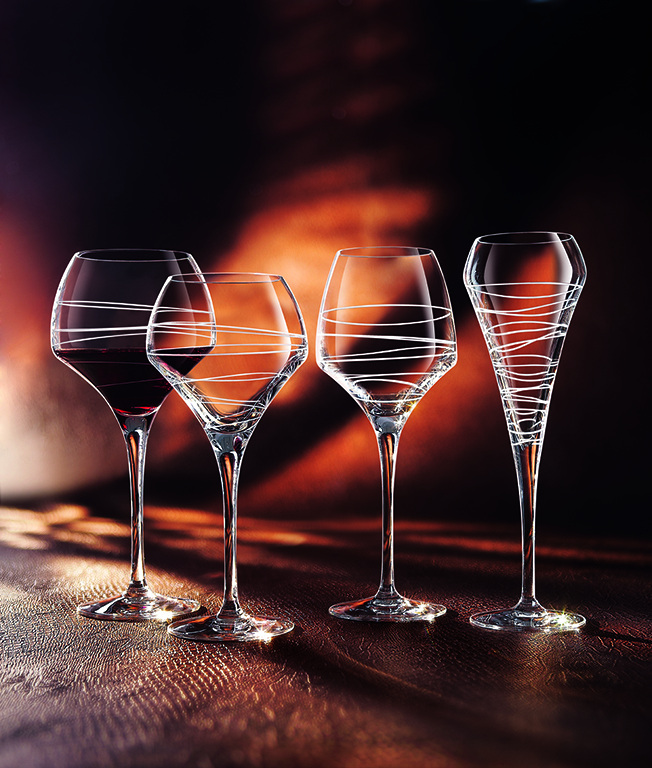 The prize is to win a Chef & Sommelier Open Up Arabesque Tannic Tasting Wine Glass Set worth £50.50. There is no cash alternative and the prize is not transferable. Closing date is midnight (that’s 00:00 hours, 12 am on Sunday night/Monday morning) on Monday 15 February 2016 (GMT) and the winner will be announced shortly afterwards. Elizabeth’s Kitchen Diary was sent a complimentary set of Chef & Sommelier Open Up Arabesque Tasting Tannic Wine Glass Set in exchange for hosting this giveaway. This is not a paid post. This post also contains an Amazon affiliate link which means if you click on it and make any purchase via Amazon we will earn a small commission and you will be helping to support our family. I love drinking white wine in the garden throughout Summer, usually with my sisters while we have a catch up. I love a Pinot Noir. Got to be red for me. I love sharing with my partner, but sometimes it’s nice to indulge alone in the bath. White burgundy with my friends. I’m currently on the prosecco bandwagon & I love to share a bottle with my best girlfriends. Red wine with the hubby, bubbly rose with the girls! Rose wine and with my mum. I like sparkling dry wine – Champagne, Cava, an English fizz, I love it with prawns and nibbles! My favourite wines are Australian reds. I love a nice Pinot Grigio. I love a glass of chardonnay with my husband at the weekend. A lovely crisp cold glass of NZ SV for me!! A simple Pinot Grigio with my wife goes down well with most meals. I love a nice cold glass of rose with my sister. I like Merlot and drinking it with hubby. Cairn o Mohr strawberry wine. My friend and I go to the winery which is local to us. I love a chilled glass of Zinfandel Rose, i usually share a bottle with a friend on a night out. I’m a Pinot girl and love sharing a bottle (or several!) with friends. A glass of merlot while relaxing in the evening. Chardonnay is my favourite & I like to drink it with my partner. A nice glass of rose, sat in the garden with a book and the sun on me (which in this country is not very often)- failing this a nice glass of full bodied red, in front of a roaring fire with candles as the lighting. I like rose, and I like to drink it with my fiancé Paul. Pinot Grigio – love a glass of an evening once we’re child-free. Pink moscatto – with my besties! I like any white, champagne and rose – just not red! My fiance and I love red wine. My favourite wine is a delicious Sauvignon Blanc from Marlborough, New Zealand. I’m still waiting for Michael Kitchen to turn up and drink it with me but, in the meantime, I enjoy it with friends and family instead. Champagne when I get the chance! Love a Malbec with a steak. A bottle of château neuf de pape with roasted steak, gratin & mushrooms! I like drinking sparkling Pinot noir with my husband. Sauvignon Blanc with seabass. Perfect! A nice vegetarian Rose, with my hubby. I love a good red wine like Cabernet Sauvignon with I usually pair with steak and sated potatoes! Merlot is good. Rose in the Summer. I enjoy a glass with my fiance. A robust red, Merlot or Shiraz. I like to share a bottle of Chablis with my husband. A glass of Merlot is as warm as a welcome and I share the wine with my family. It would look stunning in these glasses. A glass of Pinot Noir with my hubby to be!! Rosè and with my partner. Ooh- how to choose! A rioja or shiraz on a cosy winter’s eve with my husband. Or a crisp sauvignon blanc or chablis with friends and a picnic on the beach. Or maybe a rose… Every wine has a time and a place and I intend to explore as many as I can! My husband and I love Merlot, but if Im with friends its usually rose…hubby refuses to drink pink wine!!!!! a merlot with my best friend – as we have a girly catch up! I love a nice glass of Rioja or Chablis with good food and my gorgeous husband! I love drinking a marlborough sauvignon blanc with my boyfriend, its our favourite! My favourtie wine is Zinfandel Rose… can’t beat it!! I like a nice rose, haven’t got a favourite, I just tend to buy whats on offer. enjoy it on my own, when the children have gone to bed. I love champagne and I enjoy drinking it with my husband and my family. Champagne on Christmas Day with my family, great. i love a rich merlot, and i enjoy drinking with just about anyone! Gosh these are absolutely beautiful!! Perfect for my new home! Mateus Rosé with my Mum, while we have a natter. I Love a Pinot Grigio with my hubby. Sauvignon Blanc with my Wine Appreciation buddies. I love my husbands Rose homebrew….and I enjoy his company too! I like a good Merlot, and my companion would my gorgeous friend Saada. A good Merlot and me and my mum are brilliant red wine drinkers! A Spanish red shared with my lovely wife. I absolutely love Yalumba Y Series Pinot Grigio and enjoy drinking it with my best friends. Rose with the sun shining! I love Pinot Grigio and would definitely share it with my other half. Or my mum when I see her! I love an Australian Shiraz with lots and lots of cheese! I love drinking with my sisters. We always end up getting giggly after a couple of bottles! My favourite wine is Tabalier Viognier reserve. Yellow Tail Shiraz – with anyone! Barolo, and I’ll drink it with anyone who appreciates it! My fave wine is Rioja and I like to drink it with my besty! My fave wine is Rioja and I like drinking it with my husband! My favourite wine is Lagunilla Rioja and I love sharing a bottle with my lovely husband, with some nice anti-pasto or cheeses. ANY wine is my favorite ! I love a Rose wine and enjoy drinking with my husband and daughter. I like pinot noir…with friends! My favorite wines are a fresh crisp white Vermento di Sardegna..reminds me of when I met my partner! For a cold evening I love to share a bottle of Chianti with my best friends. I love a red wine on a Friday evening or with a Sunday roast! I used to love rose but sadly cannot drink any more! Great glasses though love the embellishment. Ana De- Jesus recently posted…Who Am I? Sancerre and I like drinking it with my husband. I like a nice glass of rose and I love to drink it once the kids are in bed as treat! Rioja, my favourite red wine – with friends and always with pleasure. Provencal Rose preferably drunk outside in the sunshine with friends. Even better when actually in Provence but sometimes the Yorkshire garden will do. A nice glass of Fitou with some cheese. I like drinking Sauvignon.. not really fussed who with as long as there’s wine! These glasses are absolutely divine! I love the whole shape and the ribbon embellishment. I think that the price is really good value too, especially for a quality wine glass. I intend to add them to my household wishlist! Aldis Toro Locco is really good, I enjoy drinking it with my husband. I like Abbaye de Valmagne – a brilliant French red and even better when sharing a glass with my partner! Rose and with pretty much everything! Blanquette De Limoux and sharing it with my nearest and dearest. Anything Rose with friends or hubby! It would be a vintage Cava for me, preferably on a terrace somewhere on a sunny day with friends and a big, colourful feta salad. I like Rose wine with my best friend and cousin on late nights watching movies.. I love to share a glass of rioja with my hubby. I share lovely Presecco and Rose win with my wonderful hubby of 50 years Richard (he deserves a medal but is very happy with the wine). Prossecco with my best mate Jill! Edna Valley Sauvignon Blanc 2014 with my mum! A nice Cote Du Rhone with a hearty stew prepared by my lovely wife, SALUT! I love sainsbury blush pinot grigio house wine! it’s lovely and i love drinking it with my best friend annie, can’t beat some wine and a girlie catch up! A dry white wine and some dark chocolate. Love a large shiraz on my own chilling. A lovely Sauvignon Blanc with my friends! My favourite is prosecco, and I’ll share a glass with anyone! white wine for me – particularly Pinot Grigio which I drink with my friends. A nice White Zinfandel. Delicious. I love to have a glass with my partner after a long day at work. Love Prosecco white wine, drinking with my hubby. My fave wine is Jacobs Creek Moscato Rose. It is lower in alcohol which suits me more and it has a really light and refreshing flavour. I always enjoy a drink with my other half, either snuggled up on the sofa in the winter or sitting in the garden in the summer. I love an Aleatico di Puglia – and I drink it as a dessert wine! Chilled Sauvignon Blanc with my husband. Preferably in the garden on a nice warm day. It has to be a Trivento Golden Reserve Malbec. Best served in the company of good friends. My husband and I have a thing about Merlot 🙂 It was the first red wine that we drank together many years ago in Dubrovnik so we have a soft spot for it! I love all wine and my favourite changes but usually its a big Californian zinfandel from Sonoma like Ridge and we have it with a nice meal usually venison steaks for hubby and quorn beef steaks for me. I love a Rose Zinfandel with my girlie friends whilst having a good chin wag!! Chilled Pinot Grigio or summer red with my hubby in the back garden. I love a Rose Zinfandel and love sharing it with my girlie friends to have a good chin wag!! I enjoy a glass of Sauvignon Blanc with my best friend. Pinot Grigio, with my girls of course ! Im a sucker for a good bottle of port! I dont think there can be a better way to spend the evening than a good drinkiepoo in front of a real fire when its cold outside! Pink moscato with dance moms! Love a nice glass of rose with my hubby Paul. I’m a big fan of modern Spanish wines. I love to relax with my husband and a glass of red wine. Sangiovese, the perfect accompaniment to pizza! I like the fruitiness of a good merlot. I love drinking Rose with my wonderful mum whilst we watch a new film! I like rose and am most likely to drink it when with my husband (or out for dinner with the inlaws). It was Chilean Shiraz but recently I’ve discovered Montepulciano and it’s delicious! Champagne with my friends for me! I like prosecco on a girls night! Pinot Grigio is my favourite white wine, and Merlot my favourite red. Usually drunk with my husband, or with friends and family. My glasses are nowhere near as gorgeous as these! Pinot Grigio with my hubby to be! I like a Merlot, my wife and I always have a bottle when we have a nice Sunday dinner. I like drinking Sauvignon Blanc with my husband. A chilled rose with an al fresco meal! I prefer a white wine especially when spending an evening with my best friends. merlot – i’ll drink it with anyone! My favourite wine is Cava. I enjoy drinking it with friends and my husband. I also enjoy Rioja, Fleurie and Albarino. I like a merlot, and I have to say, I tend to drink it by myself! Every wine is my fave, but I do love a bit of bubbly the most! i like a glass of white, especially when i am out with my sister. i like a cheap bottle of Lambrusco! goes down really well with a nice meal. not much of a drinker, so this is ideal for me. I like white wine the best and will sometimes drink it with a meal with my family. I’m not a wine drinker myself, but I’d love to use these to serve other types of drinks. Really stunning! I’m not a wine drinker but these glasses are gorgeous! They’d look great with a cheeky cocktail in! Red wine for me and I like drinking it with my partner with a good meal . The glasses are beautiful!